When you want to drive sales, educate your customers, train your staff members or enhance your reputation, we will deliver effective video content that really engages with your target audience. Whether you’ve got stacks of video experience, or you’ve never commissioned video in your life – we can help you to get the most from your video project. We keep things simple and transparent. Every video we create has a clear end goal in mind: Who is the audience, what do you want them to know, what should they do next. We produce business videos that deliver real results for our clients. Our experienced video team has the experience and creativity needed to produce professional video content, plus we’re friendly and easy to deal with! Whatever your goals, we will help you to make effective video – getting to know your audience, and creating content that speaks to them in the right way. You tell us what you want to achieve. Together, we define your key messages, target audience and commercial objectives. We capture and edit the footage, creating stunning, perfectly pitched video content that hits your brief. You review our work, we listen to your feedback, then deliver the final video to you, on time and in budget. Free Guide: Planning and writing a video brief. Free Guide: What to wear when you’re filming an interview. Free Guide: Our guide to commissioning a business video. Free Guide: Video marketing trends for 2018. Bakehouse Studio Ltd © 2018. 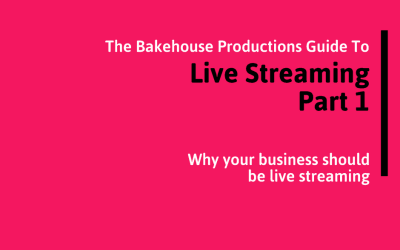 Trading as Bakehouse Productions, Bakehouse Aerial and Bakehouse Digital. All Rights Reserved. Pricing excludes VAT. No part of this website may be reproduced without Bakehouse Studio Ltd's express consent.